Last weekend, May 5, the FIA World Endurance Championship hosted the opening round of their schedule. The 6 Hours of Spa Francorchamps dropped the green flag on the tour. There was a rumored blowover crash. SMP Racing driver Matevos Isaakyan crashed in the closing hour of the even while climbing the top of the famous Eau Rouge corner. Watch the Matevos Isaakyan blowover crash video below. This particular corner has been modified many times since it’s inception. In previous years, the corner featured rumble strips that discouraged driver from going off track, making it less of a corner and more straight. Recently, those rumble strips were replaced. Instead, there is slightly raised lines. 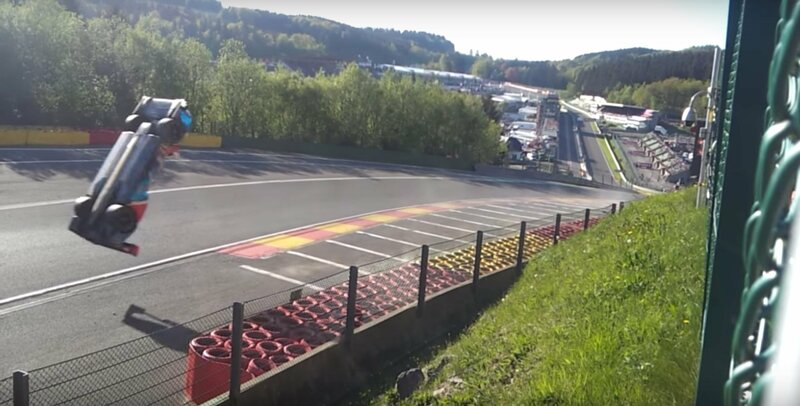 Now, a week later, fan video has surfaced showing the beginning and end portions of the Spa Francorshamps crash. Fans stated that the car did at least 2 backflips before coming to a stop against the wall. Isaakyan was already in the wheelie position as he came up the hill. He was on the new paint lines portion of the track. Once he reach the top of the hill, the air climbed under the car in lifted it the rest of the way off the ground. Watch the blowover crash video below. Pietro Fittipaldi was injured in a separate crash that weekend. His injuries resulted in fractures to both legs. In that incident, the DragonSpeed team stated it would not return to the series. The team is looking for a full incident investigation. “The driver, who was conscious at all times, was attended immediately by the Circuit de Spa-Francorchamps Medical Services and FIA Medical Delegate Jacques Tropenat, extracted from the car and taken by helicopter to the Centre Hospitalier de la Citadelle de Liège with suspected fractures to both legs. He is accompanied by the DragonSpeed Team Manager and his condition is not life-threatening,” read a statement from the FIA. Fittipaldi’s incident also took place in the Eau Rouge/Raidillon corner. Fittipaldi was schedule to run the 2018 Indy 500 with Dale Coyne Racing. Both crashes took place in the LMP1 class.